American workers, as I have argued many times (e.g., here and here), find themselves in increasingly desperate circumstances. But of course, different segments of the American working-class experience that desperation in different ways, according to the circumstances in which they find themselves. 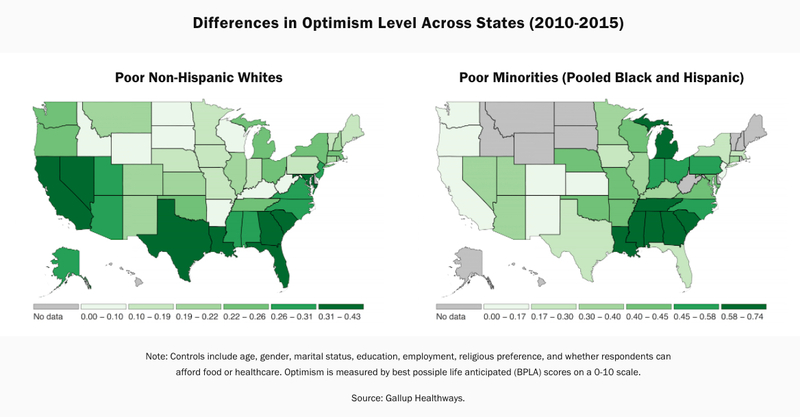 A new study by the Brookings Institution [ht: db] reveals that the degree of optimism, worry, and pain experienced by poor whites, blacks, and Hispanics varies according to where they live. Some of the results are not all surprising, given what else we know about the condition of the working-class in different places within the United States. Thus, for example, the best places in terms of optimism for poor minorities are Louisiana, Mississippi, Arkansas, Georgia, Alabama, and Tennessee (the Southern cluster of states), while the most desperate states for poor non-Hispanic whites are the Dakotas, Wyoming, Montana, Idaho, Wisconsin, Missouri, West Virginia, and Kentucky (which correspond, roughly, to the opioid and suicide belts in the heartland). A similar pattern follows for both worry and pain. But there are some unexpected findings, at least for me, in the study. For example, the worst places for poor minorities (in terms of optimism, worry, and/or pain) include blue states like Washington, California, New York, and Massachusetts. 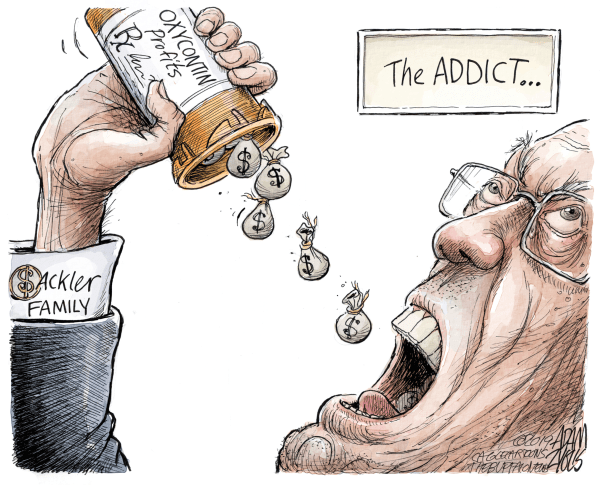 And, as it turns out, for poor whites, the situation is desperate in New Jersey, Massachusetts, and Wisconsin. We cannot answer many questions at this point. 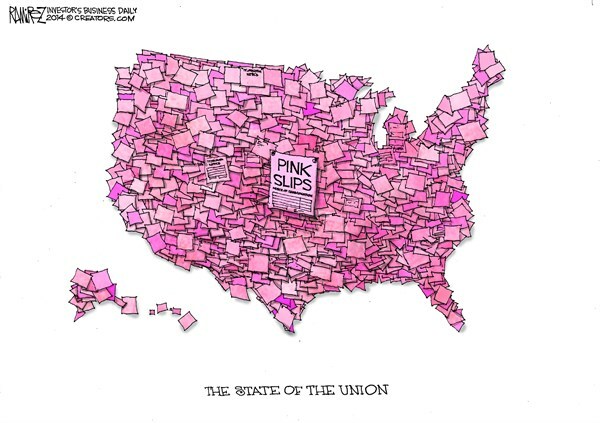 What is it about the state of Washington, for example, that is so bad for minorities across the board? Why is Florida so much better for poor whites than it is for poor minorities? Why is Nevada “good” for poor white optimism but terrible for worry for the same group? 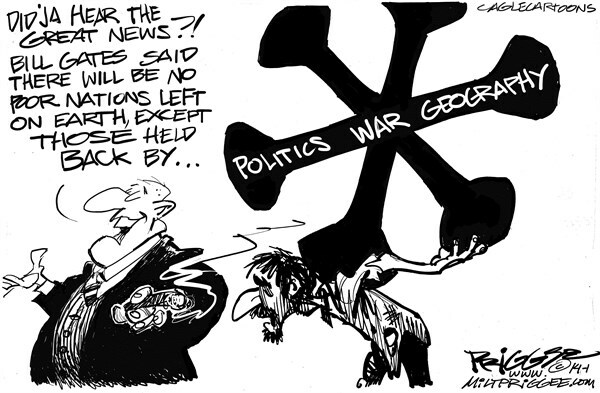 Politically, it is important to pay attention to and analyze the causes of these different placed-based levels of desperation for the various groups that make up the American working-class. 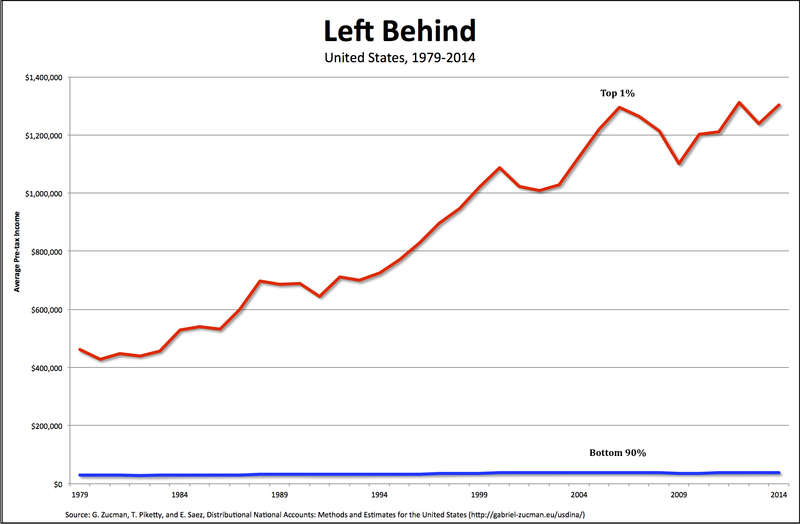 But it is also the case that overall, as I argued last November, the deteriorating condition of the U.S. working-class includes but goes beyond the obscene (and still-growing) inequalities in the distribution of income and wealth. As both a condition and consequence of those inequalities, working-class Americans have suffered from mass unemployment (reaching 1 in 10 workers, according to the official rate, in October 2009, and much higher if we include discouraged workers and those who have underemployed), real wages that have been flat or falling for decades (now below what they were in the mid-1970s) along with declining benefits, a precipitous decline in unions (from one quarter in the 1970s to about ten percent today), an increase in the number of hours worked (both the length of the workweek and the average number of weeks worked per year), a significant rise in the incidence of “alternative work arrangements” (such as temporary help agency workers, on-call workers, contract workers, and independent contractors or freelancers), and most people think good jobs are difficult to find where they live (by a factor of 2 to 1)—not to mention increasing mortality (for the first time since the 1950s), an increase in differences in life expectancy between those at the top and everyone else, high levels of infant mortality, a spectacular growth in the rate of incarceration, and increasing indebtedness (especially for student and auto loans). Creating new economic institutions that actually lead to improvements in those circumstances will benefit all members of the American working-class—white, black, and Hispanic. Then and only then will American workers feel more optimistic, have fewer worries, and experience less pain, regardless of where they live. Liberal stories about who’s been left behind during the Second Great Depression are just about as convincing as the “breathtakingly clunky” 2014 movie starring Nicolas Cage. For Thomas B. Edsall, the story is all about the people in the “rural, less populated regions of the country” who have been left behind in the “accelerated shift toward urban prosperity and exurban-to-rural stagnation” and who supported Republicans in the most recent election. In both cases, and many more like them, the great divide is supposedly one of geography: everyone is prospering in the big cities—with high-tech jobs, soaring incomes, and a proliferation of non-chain boutiques and restaurants—and everyone else, outside those cities, is being left behind. Except, of course, nothing could be further from the truth. Yes, lots of people outside of the country’s metropolitan areas have been excluded from the recovery from the crash of 2007-08 (just as they were during the bubble that preceded it). But that’s true also of cities themselves, from Boston to San Francisco. 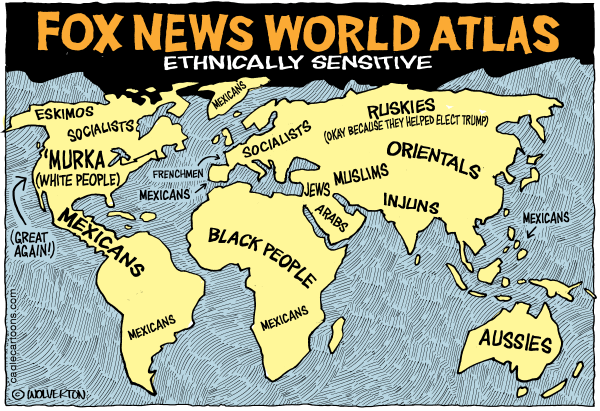 The problem is not geography, but class. According to a 2016 report from the Economic Policy Institute, in almost half of U.S. states, the top 1 percent captured at least half of all income growth between 2009 and 2013, and in 15 of those states, the top 1 percent captured all income growth. In another 10 states, top 1 percent incomes grew in the double digits, while bottom 99 percent incomes fell. Much the same is true in the nation’s metropolitan areas. In the 12 most unequal metropolitan areas, the average income of the top 1 percent was at least 40 times greater than the average income of the bottom 99 percent. 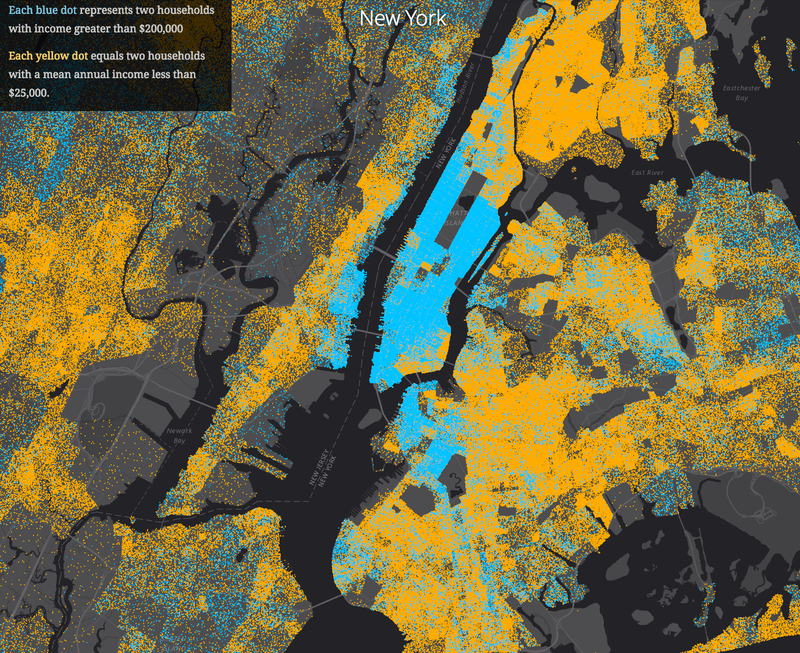 In the New York City area, the average income of the top 1 percent was 39.3 times the average income of the bottom 99 percent, in Boston 30.6, and in San Francisco, 30.5 times. By the same token, some of the nation’s non-urban counties have very high levels of income inequality. Lasalle County, Texas, for example, has an average income of the bottom 90 percent of only $47,941 but a top-to-bottom ratio of 125.6. 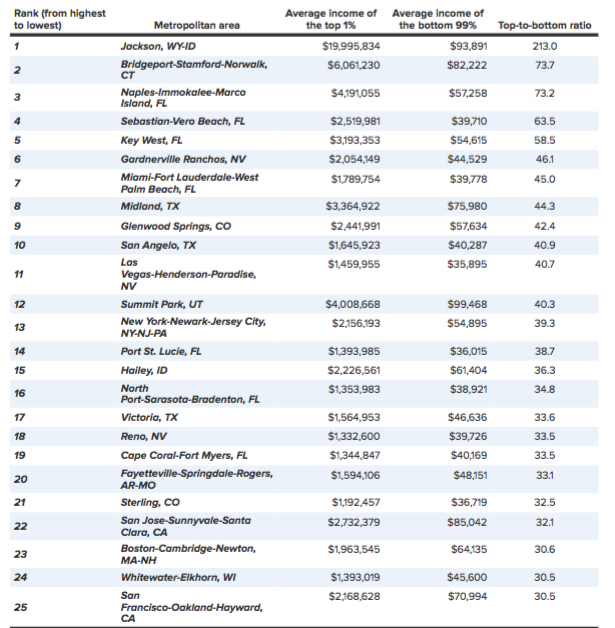 Similarly, Walton County Florida, with a bottom-90-percent income of $40,090, has a top-to-bottom ratio of 45.6. 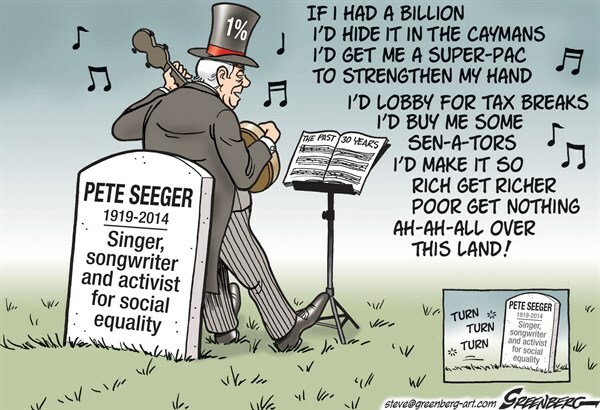 The fact is, across the entire United States—in large cities as well in small towns and rural areas—the incomes of the top 1 percent have outpaced the gains of everyone else. That’s been the case during the recovery from the Great Recession, just as it was in the three decades leading up to the most recent crash. While it’s true, the voters in most metropolitan areas went for Hillary Clinton and those elsewhere supported Trump. The irony is that the majority of those voters, inside and outside the nation’s cities, have been left behind by an economic system that benefits only those at the very top. It’s true (as I have argued many times on this blog), the number of U.S. manufacturing jobs has been declining for decades now—and they’re not coming back. Instead, they’ve been replaced (as is clear in the chart above) by service-sector jobs. And, not surprisingly, most new jobs (during the past year, as in recent decades) have appeared in urban centers. But the idea that service-sector job growth in some urban centers—or “brain hubs,” as The Geography of Jobs Enrico Moretti likes to call them—is going to solve the problem of the growing gap between haves and have-nots is simply wrong. Moretti (and, with him, Noah Smith) would have us believe that everyone in the one America that is “healthy, rich and growing” (as against the other America, which is “increasingly being left behind”) stands to benefit. And they don’t need manufacturing jobs to do so. So, no, the growth of local service jobs in so-called brain hubs is not going to solve the problem of inequality that plagues the United States. Nor for that matter is Trump’s promise to return manufacturing jobs to the United States. 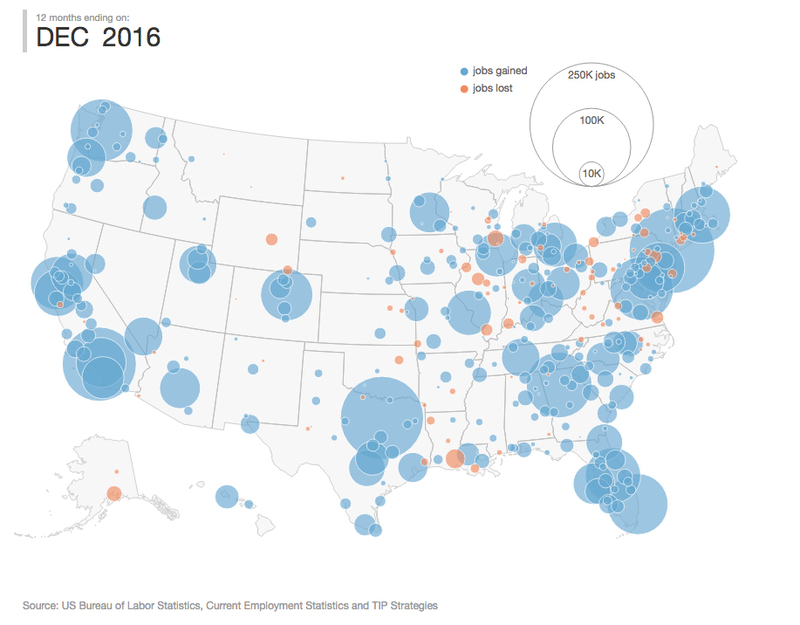 Neither the old nor the new geography of jobs is going to solve the problem of the growing divergence between a tiny group at the top and everyone else. The cause lies elsewhere—in the same old story of a growing surplus that is captured by large corporations and wealthy individuals. That’s the real problem that needs to be solved. 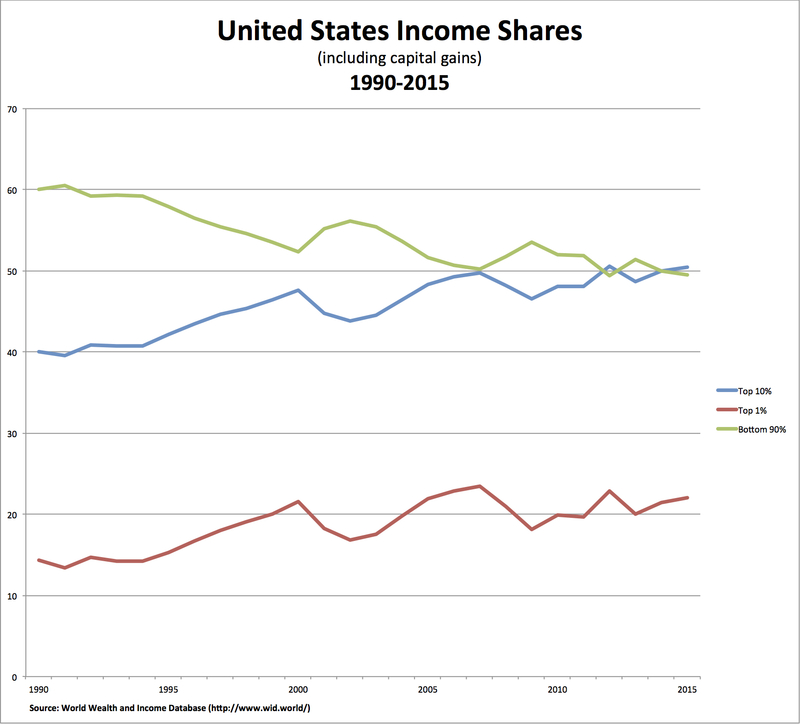 between 1990 and 2014, the states that we tend to think of as economic engines for the country — like New York, California and New Jersey — are the ones where inequality has grown the most. But the author makes the mistake of repeating the common presumption that, prior to the new millennium (specifically, between 1990 and 2000), income growth was widely shared between rich and poor. When you change the yardsticks to include changes only from the 1990s, the “rising tide lifts all boats” maxim that economists like to talk about seems to hold true. 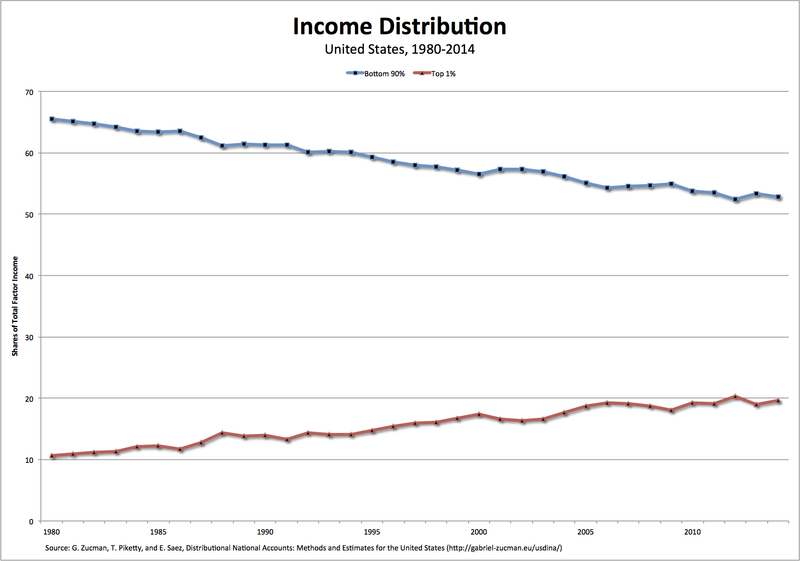 Incomes grew almost across the board, poor to rich; they sag only for the upper middle class. Nothing could be further from the truth. 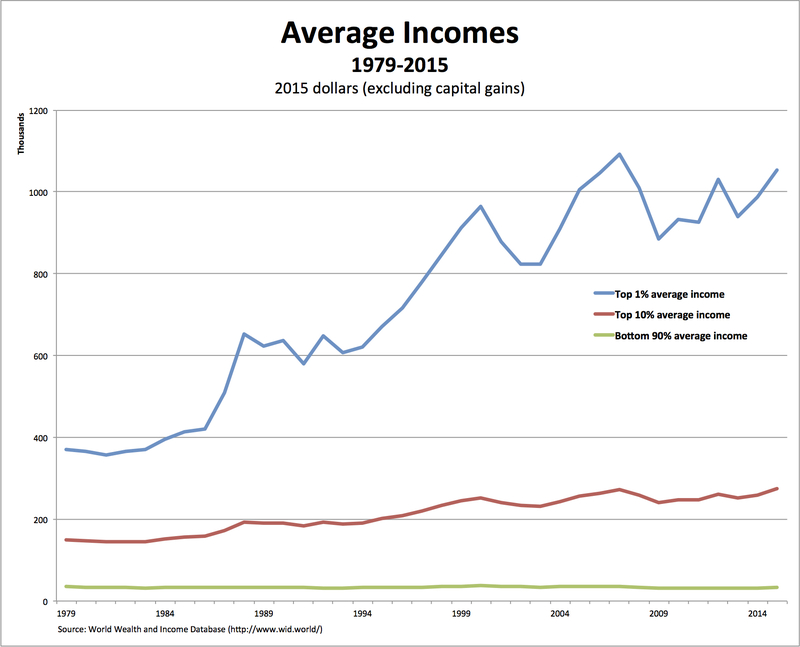 Whether in terms of income shares (in the chart at the top of the post) or average incomes (as in the chart immediately above), the rising tide left the rich richer and everyone else—the bottom 90 percent—falling further and further behind. There simply has been no shared prosperity in the United States—not in the last decade of the last millennium nor in the first decade and a half of this one.